While putting together the pics & movie of the Organ Queen painting made for Acusticum/Organ Festival last week, I thought I’d show you my recent and ongoing collab with PHILIPS! 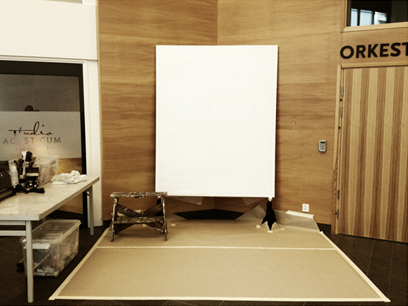 They are launching a new tv screen “Walls by Philips”, and I have the pleasure, with three other artists, Lasse Åberg, Amelie Hegardt och Christian Beijer to be featured to illustrate the concept. Below pics from Hem & Villa tradeshow and a shopping mall in Stockholm as PHILIPS is touring to exhibit their new product. Tomorrow 9 am I am starting the project of “The Organ Queen”. Part of the documentation of the Organ Festival, October 11th- 22th. at Acusticum in Piteå. We started planning next week’s challenge for months. In a few words, there is an organ festival taking place in the city of Piteå/Sweden 11th-22th of October. A huge and magnificent organ (Yes I’ve been “in it”…) has been built in the Concert Hall of the Acusticum (Institute of Media & Music) during 3 complete years, by a reknown organ builder/designer from Germany. So now, coming up is the inauguration and a ten days festival during which many organ “rockstars” and organ lovers will have the opportunity to meet, mingle and enjoy daily concerts. The last concert will be performed by “the” Benny Andersson. My job there, will be to paint, live, a canvas of 200 x 160 cm, representing this organ in my kind of way… Tricky was my first thought. But as it came along, I met musicians, organ builders and did some research and all the pieces fell in place the day someone told me that the organ was the “Queen of all Instruments”. 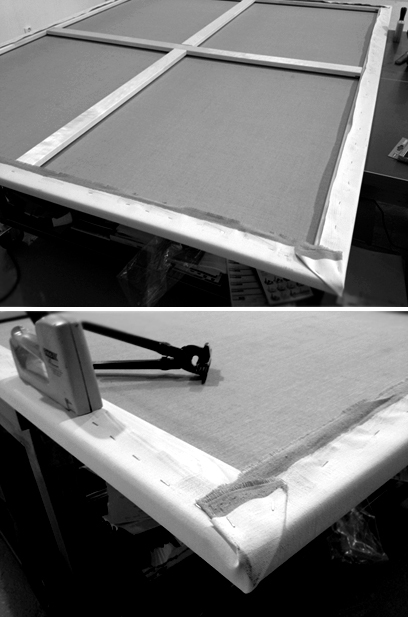 Getting started, me assembling the frame and stitch the canvas on place. For more info about the festival (in swedish).